International-inspired dishes prepared á la minute and served all-you-can-eat from 12:00 – 17:00 every Sundays. Bangkok, 2015-7-24 — /Travel PR News/ — Brasserie Europa, an all-day-dining international restaurant at Siam Kempinski Hotel Bangkok, introduces its new main dishes, featuring the freshest ingredients and highest quality available in the market. 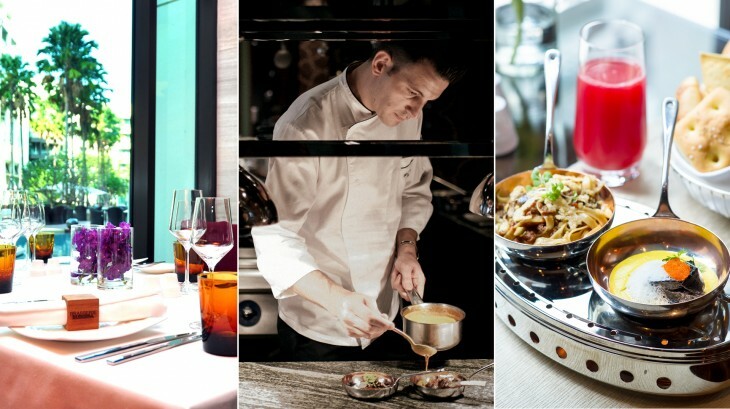 Using European-style cooking techniques, the chefs have created dishes inspired by international recipes for the restaurant’s famous Sunday Longest Lunch starting from this month onwards. The delectable new main dishes prepared individually à-la-minute by the talented culinary team include: Australian beef tenderloin served with beetroot mash, roasted seeds and Café de Paris butter; Arabian-inspired New Zealand lamb chop served with sweet and sour roasted pumpkin, shaved Halloumi cheese and Harissa chilli paste; Asian-style poached snow fish served with shaved leek, ginger and soy sauce; grilled tiger prawn served with green asparagus, baby shallots and lemon butter sauce; French duck ragout fettuccini served with wild mushrooms and crispy herbal Parmesan cheese; Maine lobster ravioli in sweet corn sauce topped with Tobiko caviar; and Thai-style soft shell crab curry. All-you-can-eat food stations include: fresh seafood on ice, oysters, selections of foie gras, Thai and Western appetizers as well as imported cheeses from different European countries and a selection of cold cuts from the charcuterie station. A dedicated dessert room features premium chocolate fountains along with homemade, mouth-watering sweets, Thai desserts and seasonal fruits. Enjoy prestigious free flow Louis Roederer Brut Premier Champagne NV and refreshing creative cocktails or non-alcoholic cocktails packed with flavour in addition to unlimited juices, soft drinks and tea and coffee from the beverage station, which will ensure a delightful Sunday afternoon for the entire family. The little ones aged between 4-12 can enjoy complimentary access to the Kempinski Kids Club. The Kempinski Sunday Longest Lunch is open from 12:00 noon to 17:00 and is priced at THB 3,150 per person with a free-flow alcoholic beverage package, THB 2,200 with free-flow juices and sodas, THB 1,200 for children aged 6-12 and complimentary for children under 6. The prices are subject to 10% service charge and 7% government tax. Reservations are highly recommended by calling the hotel on 02 162 9000 or emailing dining.siambangkok@kempinski.com. Located in Siam Square, the heart of Bangkok’s busiest shopping and entertainment district, and just steps from Siam Paragon Premier Shopping and Lifestyle Complex, Siam Kempinski Hotel Bangkok offers a variety of memorable dining experiences, including Thai and international delicacies, in the beautiful surroundings of its large landscaped garden and free-form swimming pool, uniquely creating a resort-like atmosphere in the city centre. This entry was posted in Food & Drinks, Hospitality, Hotels, Travel Management, Travel Services, Travelers and tagged Brasserie Europa, international restaurant, Siam Kempinski Hotel Bangkok, Sunday Longest Lunch. Bookmark the permalink.